From PROTO MALAYO-POLYNESIAN *siRi, through PROTO OCEANIC *jiri and PROTO CENTRAL PACIFIC *jï. This is a word whose core meaning has remained fairly constant for over 5,000 years, despite comparatively minor changes in its form but major changes in the location of the people using it. Originally the Proto Malayo-Polynesian word *siRi was probably a generic term covering members of the genera Cordyline and Dracaena. This is not surprising, and the two genera are closely related and the habit of growth and appearance members of both genera is quite similar. 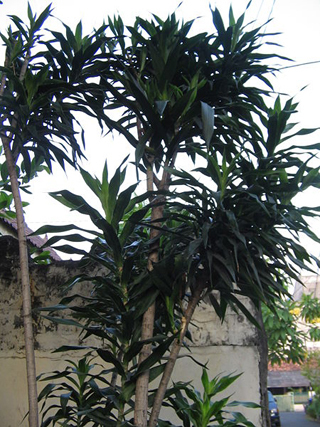 This meaning persisted through the Proto Oceanic period, but came to refer primarily to the two most significant species, Dracaena angustifolia and Cordyline fruticosa. Both plants had (and continue to have) important ceremonial and practical uses in Oceanic cultures. 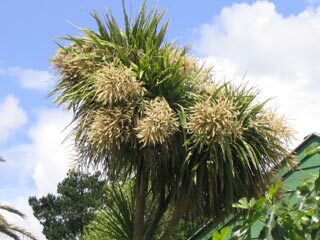 For the Polynesians the word came to denote especially Cordyline fruticosa, which they carried with them to the furthest reaches of their settlement, in Hawaii and Aotearoa. It provided leaves which could be used for a wide variety of purposes, from wrapping food for transport or cooking, making rainware, temporary thatching, among many other purposes, and the roots could be baked to provide highly palatable emergency food or dessert. The botanical classification of the Tï (i.e. members of the genus Cordyline as a group) has become very controversial over the last few decades; firstly it was shifted, with the agreement of most taxonomists, from the Liliaceae (lily family) to the Agavaceae (agave family) -- so the New Zealand flora no longer had the world's largest lily (Cordyline australis); however one current proposal is that the genus should be included in the Asparagaceae (asparagus family), which may give us the world's largest asparagus. 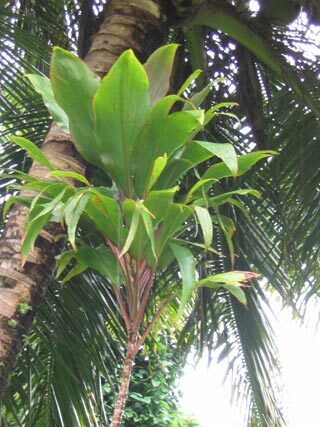 Others would take Cordyline and Dracaena from the Agavaceae and group them together in a new family, Dracaenaceae, or leave the Cordylines with the aspagagi, but move Dracaena to yet another new family, the Ruscaceae, and place the Cordylines together with the arthropodiums (renga lily and its relatives) in yet another new family, the Laxmanniaceae. We will leave them with the agaves for now. Interestingly, Cordyline fruticosa is now known around the world as the tï (tii), even where the local name is still used -- the modern Hawaiian reflex of Proto Polynesian tï is actually kï, but when speaking English even many Hawaiian residents refer to the plant as the "tï". I enquired about its name in a remote part of the Mindanao in the Philippines (where there are local names for Cordyline species in most languages), only to be told by everyone that it was a "tï", which was actually the only name that this plant was known by in the area -- so the Polynesian variant has colonized at least parts of the homeland! Photographs: The photograph of Dracaena angustifolia is from commons.wikimedia.org/wiki/File:Suji.jpg; the other photographs are by R.B.